It’s that time of year again! The summer is already starting to wind down, the AP Chemistry scores have been released, and now, at the Biennial Conference on Chemical Education (BCCE) 2018 at Notre Dame, Paul Bonvallet and his crew of talented educators have given their analysis and debrief. All of this, and processing my own students’ scores, has made me feeling rather introspective about the results this year and of AP Chemistry in general. I will be blunt. My students’ AP scores this year were not what I had hoped for. I had a personal goal of a 70% pass rate, and I fell far short of that, much to my and my students’ chagrin. 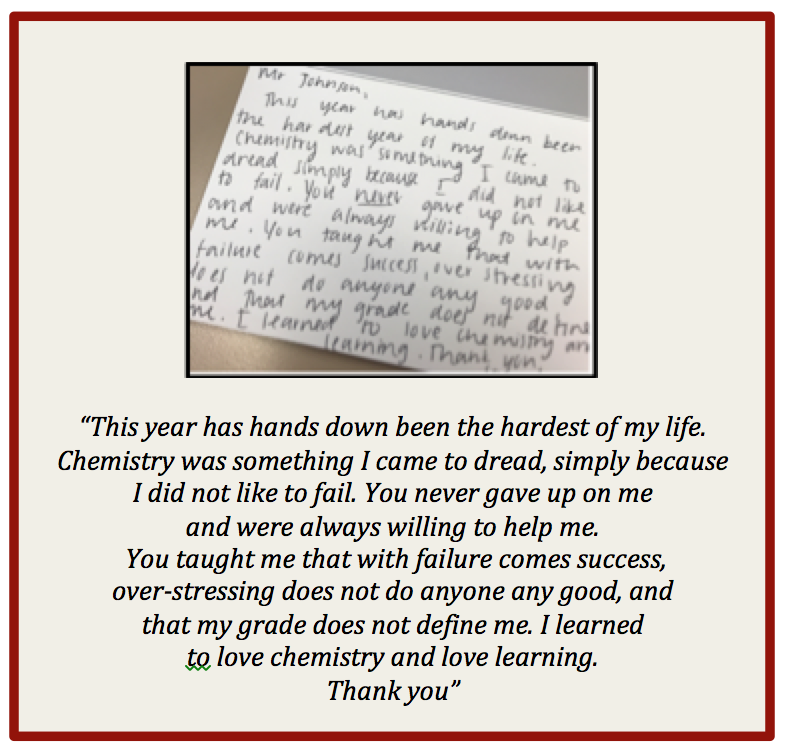 But something incredible happened before, during, and after the exam this year that has made me feel heartened and excited about my future as a chemistry educator, and for my students’ future. I could spend the next three paragraphs trying to encapsulate my feelings, but a student of mine did it best in a note that she wrote to me. This letter meant more to me than any 5, any gift at the end of the school year, any kudos from an administrator. My student had learned something this year more valuable than K vs. Q, more long-lasting than rate law, more impactful than when to use the Nernst equation. She had realized that failure is important. That stumbling helps us grow. That in order to develop herself as a learner, she couldn’t depend on just grades to get there. I had many students this year who were very high-achievers. They were used to getting straight “A’s”, to not having to work very hard for success, or to always being successful at everything they tried. Some of these students would come to class late almost every day...not because they were slacking off in the hallways, but because they had multiple AP courses for which they were trying to get extra help between classes before coming to mine, then rushing to jobs, sports, or family responsibilities after school. I’m sure that many, if not all, of us have these students, and the pressure of the AP exam can be an extreme one. The stress of shooting for that 5 is powerful, for both students and teachers. But I’m here to argue that the process, the takeaways, and the lessons learned in and out of the classroom because of this is FAR more important than a 1, 2, 3, 4, or 5. The student who wrote me this letter has learned that she can derive powerful learning through failure, struggle, and ultimately success. This statement may be controversial in the education community, but I would go out on a limb to say that I would HAPPILY have every one of my AP Chemistry students earn a “3” on the exam, as long as they walked out of my classroom feeling enriched, enthusiastic, curious, and excited to learn more chemistry. That’s what it’s all about for me.